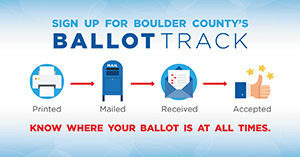 Ballot Track is a free service for Boulder County voters that can send you notifications by text message, phone call, or email when your ballot has been sent and received by our Elections Division. Click the Sign-up for Ballot Track button to receive notifications about your mail ballot or to manage your current message preferences. Already signed up for Ballot Track and need to change your preferences? Just click the button and enter your info. All active registered voters in Colorado will now receive a ballot in the mail for every election. You can return your ballot by mail or deliver it to one of our convenient ballot drop-off locations. No matter how you return your ballot, Ballot Track will let you know when it has been safely received for counting! How does Ballot Track know where my ballot is? We first notify you when your ballot has been printed and mailed. Then, your ballot envelope is printed with unique bar codes, which are scanned when your ballot packet is received back by our Elections Facility in Boulder. These bar codes allow us to let you know when your ballot envelope is received back at our office. In future elections, we may add additional alerts so that you know when your ballot is received by the Post Office both outgoing and incoming. How and when will Ballot Track notify me? If you sign up to receive a phone call, SMS text message, or email, you will receive automated messages when your ballot is mailed to you and received back by Boulder County Elections. You also would receive a message if your ballot is returned as undeliverable, or cannot be processed for some reason that requires your attention. 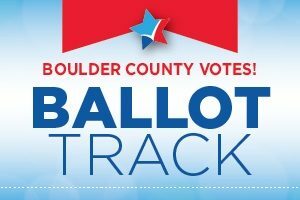 Ballot Track is free for Boulder County voters! There’s no cost for your account or messages. However your phone carrier’s standard text message or voice rates may apply. Simply log in to Boulder County Votes Ballot Track at any time to change your preferences, turn off notifications or check the status of your ballot. For more information, please contact Boulder County Elections at 303-413-7740.